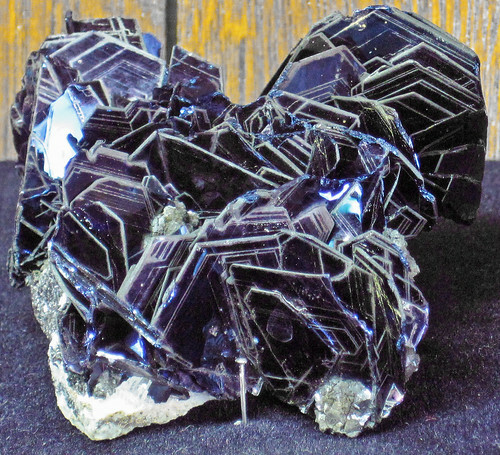 Covellite is an attractive, deep metallic blue mineral having the formula CuS - copper sulfide. It's principally a secondary sulfide mineral, formed by the breakdown of pre-existing copper-bearing sulfides, but also occurs in a massive or crystalline form as a primary mineral. Covellite has a metallic luster, an intensely deep blue or purplish blue color, a dark gray streak, and is quite soft (H = 1.5 to 2). Well-formed crystals are hexagonal plates with a somewhat micaceous appearance. The wonderful crystalline covellite sample shown above is from Montana's Butte Mining District. In this area, covellite occurs in 62 to 66 million year old copper sulfide-rich hydrothermal veins that intrude the Butte Quartz Monzonite, a pluton of the Boulder Batholith (mid-Campanian Stage, late Late Cretaceous, 76 million years).